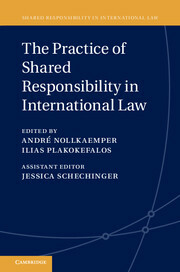 This is the third volume to appear in the book series Shared Responsibility in International Law. This book series as a whole provides new perspectives on responsibility problems that arise from the increasing number of situations in which states, international institutions, and other actors engage in concerted action in the pursuit of common objectives. This first volume laid the groundwork by critically reviewing the established principles of international responsibility as developed by the International Law Commission (ILC) from the perspective of shared responsibility. The second volume engaged in a fundamental inquiry into the bases and justifications for apportionment of responsibilities that could support an articulation of critique of current international law, and provide a basis for reform. The present, third volume of the book series explores the practice of shared responsibility in international law. Based on the recognition that the applicable rules and procedures for shared responsibility differ between particular issue-areas, it will map relevant practices of shared responsibility in over forty issue-areas, including military operations, protection of the environment, migration, and trade and investment. The volume exposes the diversity in the law of responsibility, but also provides building blocks for cross-fertilization, learning and a further development of international law.